Hull people talking and working on the problems of climate change and oil decline for the city. Turning Point - A return to community. This film takes an inspiring look at our potential to create a life-sustaining society as we face the twin challenges of Peak Oil and Climate Change. 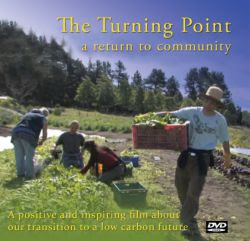 It is a powerful film showing innovative and practical ways to reduce our reliance on fossil fuels and we have a copy!! Everyone is welcome, children must be accompanied by an adult. Come to the Barn Dance!! Friday 17 Sept, Boulevard. This will be at Boulevard Village Hall, Boulevard Hull. Tickets for this are £3, available by phone and can be collected at the door, and £2 if you bring some homemade food to share! 07816 141169 or 07904 626479. This is an autumn event put on by Transition Hull. Being unexpectedly offered a place at this important conference for local rural businesses, I took my Hull Transition Towns hat along to Bishop Burton on Tuesday morning to see what was what. 10 excellent presentations later, stimulated, excited and a bit tired, I sit down to to try to digest it all. What came across mostly was just how enthusistically all were engaging with the challenges that are gaining a growing acceptance – climate change, decline in fossil fuels, economic crises et al. Food security is the main agenda for everyone and the big challenge for farmers and food producers. But underlying the need for more and better local food is the need to prepare the land, reduce energy needs and alter energy sources, address water fluctuations, cope with the acceptable and reduce the unacceptable waste at all stages of growth, production and distribution. No relevent topic was left out of the agenda which also dealt with issues around population growth, deforestation, water shortages, the conflicting demands of different states and countries and their global effects. All were dealt with with enthusiasm for the challenge, a sense of adventure, accurate knowledge, cogent argument and humour. Small rural businesses and the farming community were perhaps not best pleased to hear from a senior economist that money was going to continue to be tight; adaptation and flexibility were going to be much needed attitudes. For me, though, I was delighted that so much work, research and effort was going into this whole field as a matter of course. These challenges are now being taken for granted as subjects with which we are all going to have to engage from here on in. "And to all of you - all around the world! - thanks so much for strengthening our growing network with your community initiative. This new set of "official" initiatives is truly wonderful - so many great people, so much excellent work already underway. We're constantly amazed at the people who are stepping up into the core groups - reading through the biographies is a truly humbling - and inspiring - experience. Y'know, mebbe we really are going to succeed in creating this ambitious future we've all chosen to pursue." Open meeting, every second Monday at The Eagle, Anlaby Road. Monday 8th February 7.30pm , the Eagle (side room).